For the first time in school history, an academic team from Clinton County is a regional champion. On Saturday, February 2, the Clinton County Middle School Academic Team traveled to Pulaski County to compete in regional Governor’s Cup competition. After a long day of matches, Clinton County emerged as the Quick Recall Regional Tournament champions. This achievement tops an undefeated season for the CCMS Academic Team, which did not lose a match during the Lake Cumberland Academic League held in October through December. The team was also undefeated in both District and Regional Governor’s Cup competition. Two students from Clinton County also received individual honors for written assessment. Loren Little placed first in Language Arts and Evan Little placed first in Arts and Humanities. The entire academic team, as well as those students receiving individual honors, will now advance to the State Governor’s Cup competition in Louisville on March 16-18. Coached by Ashley Shelton this year, the Clinton County News spoke briefly with the excited coach about how the team prepared for the Governor’s Cup competition, the enthusiasm about the championship title, and how the team is preparing for it’s run in the state level of competition. There is a ton of preparation that goes into participating in an academic meet. Shelton is in her sixth year as academic team advisor. This year’s team consists of 15 members from the Clinton County Middle School. Shelton said the Quick Recall matches will begin early Sunday morning the week of the state meet. Finals will be on Monday, and Shelton hopes her team will advance and be in the finals. State Competition will be held March 16-18 at The Galt House in Louisville, Kentucky. 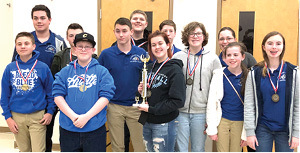 The Clinton County Middle School academic team, with its Quick Recall Regional Tournament trophy, is shown in the photo above. Team members are, from left to right, front row: Ryan Bair, Logan Cross, Emma Tompkins, Valerie Latham, Loren Little (First in Language Arts). Back row, left to right: Alex Duvall, Malachi Upchurch, Evan Little (First in Arts and Humanities), Caleb Marcum, Adam Whittenburg, Ella Rose Smith, Coach Ashley Shelton.